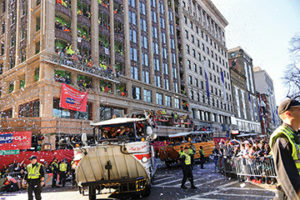 The air is filled with confetti, the side of the building is filled with construction workers, the windows and balconies are filled with fans, and the sidewalks are jam packed with fans as the duck boats turn the corner from Boylston Street onto Tremont Street during the Patriots Super Bowl parade on 2/5/19 in Boston. Photo by Glenn C. Silva. 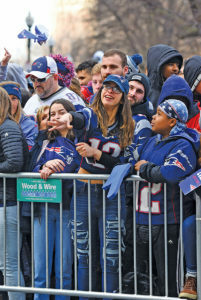 The Patriots had done it again and with only a day to recover from Sunday’s Super Bowl LIII victory I was on the 4:30 a.m. bus into Boston to see “the guys” count the trophies, six of them now, and cover the celebratory parade Tuesday morning. After witnessing how deep and tight the people were packed from the Red Sox parade I attended just 97 days ago I wanted to make sure I got a good spot. With the help of technology I was able to see via Google Maps the lay of the land and decided where the best spot was to get a nice picture of the duck boats as they went by. I had packed my gear the evening before and knew it would be in the mid 30’s with a slight chance of rain when I arrived but the temps would climb to the low 60’s by noon. A far cry from the snow and rain we had two years ago when they last won the Super Bowl. There were very few signs that in just five hours there would be a million people here. Sure there were some barricades set up but aside from the couple that had just come out of the Starbucks across the street in Patriots’ garb you’d never suspect anything out of the ordinary. I met up with a colleague that had never shot this type of event and we stood and waited. As the first hour went by a few more people showed up, then a few more. It had stopped drizzling and then the sun came up. People started setting up chairs and more and more were getting off the green line stop at the Boston Common across the street. They came in packs at first then by the trainload. The MBTA had added seven more coach cars on select scheduled trains as well as 16 extra trains on top of the normal schedule to accommodate the highest rider­ship ever seen on the Boston network. We were packed tight but I had a front row seat for this thing! There was a building being renovated across the street on a high rise and every bit of scaffolding and building opening was full of construction workers and they were waiting too. Officials stopped the traffic and blocked off the remaining openings in the parade route. It was getting close. Sure there were people from ou area here but I met fans from RI, CT, VT and a woman who even flew in from Florida just to see the parade. 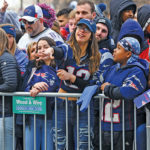 Fans made giant paper airplanes and flew them across the street while waiting for the Super Bowl parade on 2/5/19 in Boston. Photo by Glenn C. Silva. As time passed the crowds passed footballs around and flew gigantic paper airplanes made out of the cardboard handouts with the various Patriot slogans. Then 11 a.m. came and went and we waited and cheered. The parade was on its way. Then at noon there was a roar in the distance and we could hear cheering, and it got loud really fast. The police were on motorcycles and flew by, and, here they were. The duck boats with our beloved team! On the very first duck boat was Robert Kraft the owner of the Patriots, and he had a trophy. Then there was coach Belichick with another and Tom Brady with yet another. It seemed everyone had one. Oh yea, we now have six! Gronk was being Gronk, dressed in a reflective police vest and getting the crowed even more pumped up — if that was even possible. The confetti cannons were working full time and at times you couldn’t see anything. The crowd was deafening. Then as quick as it had started, it was over. I think it took about 35-40 minutes from start to finish, but so worth it. As the crowds began to thin my colleague and I decided to walk down to China town for some Cantonese dim sum and enjoy the day by walking the city. After all it was now sunny and a warm 61 degrees. I noticed we weren’t the only ones to hang out in the city. Everywhere you looked people were in Patriots jerseys and just enjoying the spring-like day. And yes, I got some of it for proof that I was there. 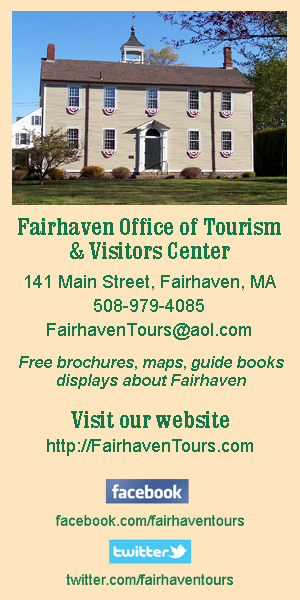 See you at the next parade! 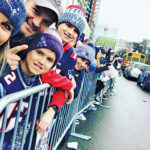 L-R: Dawn Cormier, Shaun Cormier, Lucas Cormier, Noah Cormier, and John Higgins, all of Mattapoisett grab a great spot right at the barrier to watch the Patriots Super Bowl Parade on Tuesday, 2/5/19. Submitted photo. 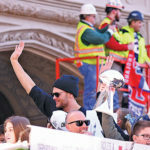 Tom Brady waves to the million+ people that showed up for the the Super Bowl parade on 2/5/19 in Boston. Photo by Glenn C. Silva. 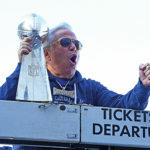 Patriots owner Robert Kraft holds one of the six Super Bowl trophies and gives a shout to the crowd during the duck boat parade celebration held in Boston on 2/5/2019. Photo by Glenn C. Silva.